Business strategy's reach is vast, and important too since wherever there is business activity there is strategizing. As a field, strategy has a long history from medieval and colonial times to today's developed and developing economies. Contemporary analysis began with Chandler's Strategy and Structure (1960), and subsequent theorizing includes Porter's 5-forces, the resource-based view, and behavioural economics. This series will offer a place for interesting and illuminating research including industry and corporate studies, strategizing in service industries, the arts, the public sector, and the new forms of Internet-based commerce. To meet the needs of the field's demanding methodologies, the series will also cover today's expanding gamut of analytic techniques. 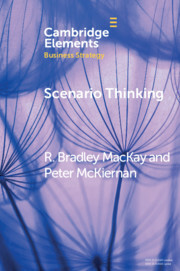 Receive email alerts on new books, offers and news in Elements in Business Strategy.